Last modified on August 21st, 2014 by Joe. Mind map is a diagrammatic way of representing a thought process, ideas and concepts. An informal way of organizing unstructured information. We start from a central concept and branch out from there and create an ecosystem around it. The advantage of mind maps is there is no real hard standard like UML. Anything even a rough note that is understandable and coherent is a mind map. Generally it will look like a spider web. I was introduced to mind maps in a ‘Research Methodologies Workshop’ conducted by Anna University in Chennai. Then onwards, I use mind maps frequently for various purposes. I strongly recommend you to try your hand and create couple of mind maps and get used to it. It is a powerful tool and will help you organize the thoughts. If you are at the lowest end of the ladder, most probably taking minutes of meeting (MOM) will be thrust on you. Next time, try to draw a mind map of the meeting, have fun and impress your boss. 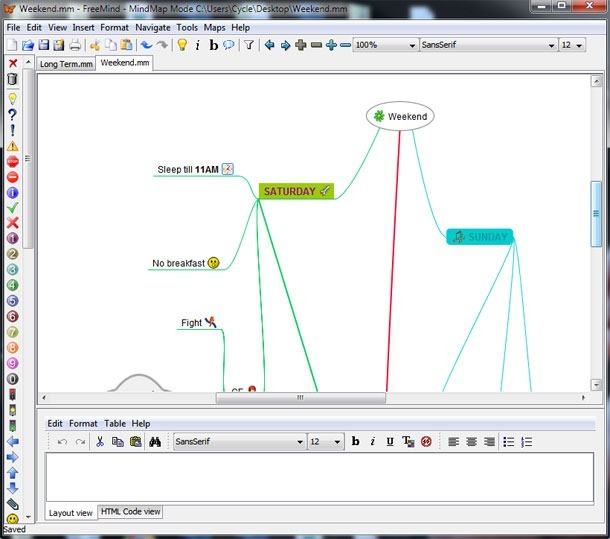 There are many mind map software available in the market, both $ and free. We all like free software (when we use), right? FreeMind a free mind mapping software hosted at Sourceforge. Yes Sourceforge! yesteryears code hosting superstar. FreeMind is being actively developed, maintained and supported. FreeMind is based on Java, you can checkout the code and have an inner look at application. It will help us get a good hold on thick client application using Java. This article is not a detailed review or how to use documentation for FreeMind. As part of Javapapers gallery, I wanted to introduce a Java application that is being widely used. FreeMind is a feature complete software. You get everything to come up with an excellent and efficient mind map, all for free. Thanks to the lead Christian Foltin the FreeMind team. It comes with good documentation to help you get started and a gallery of showcase to inspire. Age old UI. Does not use, modern UX elements and capabilities. By default, elements are grey and dull. Generally MindMaps are done in a colorful way. To make the diagrams colorful we have to go through a little labor. If you are looking for a free mind mapping tool with support for all popular platforms and that will get the job done without any fancy bells and whistle, FreeMind is the software to choose. Comments on "Java Mind Map Free Tool: FreeMind"
The weekend mind map is very interesting. Good to know about the Free Mind map software. Your simple example creates interest to try our own mind map. Did it have a web interface as well ?? Or only a desktop version ? Hi Joe. Good explanation on mind maps.what is the adaptivity level of such tools in corporates.can u propose a tool which r widely used across companies. Comments are closed for "Java Mind Map Free Tool: FreeMind".